Led by top industry professionals, masterclasses are run throughout the year in addition to our core courses. These workshops are designed to help writers unlock a deeper understanding of particular elements of story craft, such as: voice, dramatic tension, dialogue and school or literary festival presentation. Masterclasses are only available to Golden Egg members unless otherwise stated. Spaces are limited so book quickly to avoid disappointment! To book your space, contact jo@goldeneggacademy.co.uk or tessa@challiscombe.com. This workshop is open to anyone who is interested in finding out about picture book writing. It is recommended for writers who are at the start of their careers and who would like a better understanding of how to prepare their work to stand the best chance of securing a place on the academy’s popular Picture Book Plan. Numbers are limited to 16 and will be allocated on a first come, first served basis. 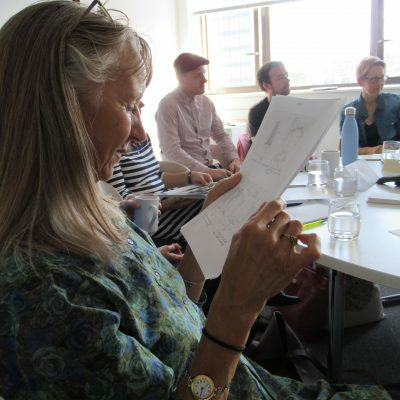 Senior industry editor, Jo Collins, hosts this introductory session, where we will discover the crucial ingredients of a successful picture book. discussing next steps and ways you could progress on your picture book writing journey. This workshop is for Picture Book Plan Graduates and published children’s authors who want to develop their gifts as comic writers. Numbers are limited to 10. We will be working together to critique and revise manuscripts under development and to draft new material. Please be prepared to read your work aloud and to offer feedback. Group Critique Workshops are inclusive of lunch and refreshments. This workshop is for Picture Book Plan Graduates and published authors who are working to give their characters genuine child-and-parent appeal. Numbers are limited to 10.